Peaceful and secluded, this unique resort and hotel boasts a fantastic location on the beach of Mui Ne, Vietnam. Guests can experience unique Vietnamese culture at the local fishing village just 14 kilometers away and take in the beautiful sand dunes five kilometers away. Kitesurfing, along with other exciting water sports, can also be enjoyed. 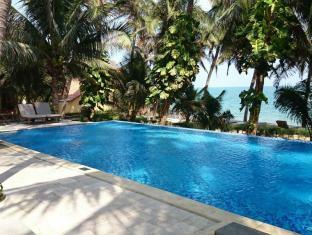 The resort offers 20 accommodation units all overlooking the beach and well-maintained coconut garden. Modern facilities such as wireless Internet access are well-equipped in each room. As for dining, the restaurant & bar specializes in Vietnamese and Western cuisine. Sunshine Beach Resort is ideal for a fun getaway, whether for couples or families on holiday.